“The Community Leadership award is different. This award isn’t measured in revenue dollars or appointments booked or NPS scores. Because while sales figures and production metrics are important, they aren’t the whole story of who we are. We bring positive energy to everything we do. We are a group of people united by one common goal: To make a difference in the lives of our homeowners, our colleagues, our families, and our communities. Matt Esler, CEO of Esler Companies, and Betty Shea, Program Director for Window of Giving, received the award on behalf of all Esler Companies. “I truly feel that it [WoG] represents the best parts of what we do as a company, and what we do as a network,” said Matt. Matt credited Betty Shea for breathing life into Window of Giving, and making the vision a reality. 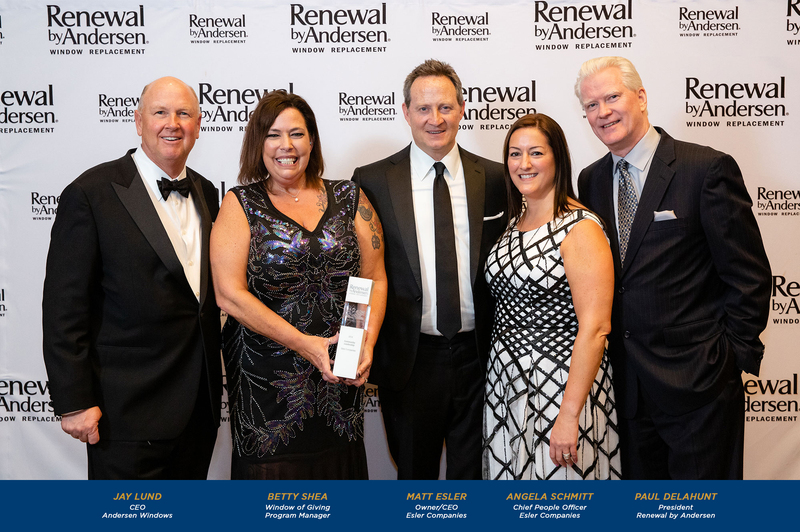 Last week, RbA posted to its network on LinkedIn & announced Esler Companies as winner of the 2018 Community Leadership Award.